Doug has had a good 2018. According to a Tom Pelissero of NFL Network, the Philadelphia Eagles picked up the fifth year of head coach Doug Pederson's contract, which will keep him under contract through 2020. The #Eagles picked up an option in coach Doug Pederson's contract after the Super Bowl win, per sources. Original four-year deal now a five-year deal, and Pederson is signed through 2020. It's been a pretty good 2018 for Pederson. He won a Super Bowl, had a day named after him in the town where he lives, he is writing a memoir, and now he has some extra job security. It's unclear whether Pederson gets a bump in pay, but he'll be guaranteed his money with the Birds for at least the next three years. From the minute Doug Pederson was announced as the Eagles' head coach in 2016, he immediately had to answer for Andy Reid's late-game clock management strategy in the Kansas City Chiefs' playoff loss to the New England Patriots the previous weekend. After the thrill of a 3-0 start in 2016 began to fade away, Pederson would hear about bad play calling choices against the Dallas Cowboys, a lack of effort from a number of players against the Cincinnati Bengals, the failed decision to go for two late in a meaningless game against the Baltimore Ravens, and most infamously, the proclamation from former GM Mike Lombardi prior to the start of the 2017 season that Pederson was the most unqualified head coaching hire he had ever seen. Some of the criticism was warranted. Some of it was beyond absurd. 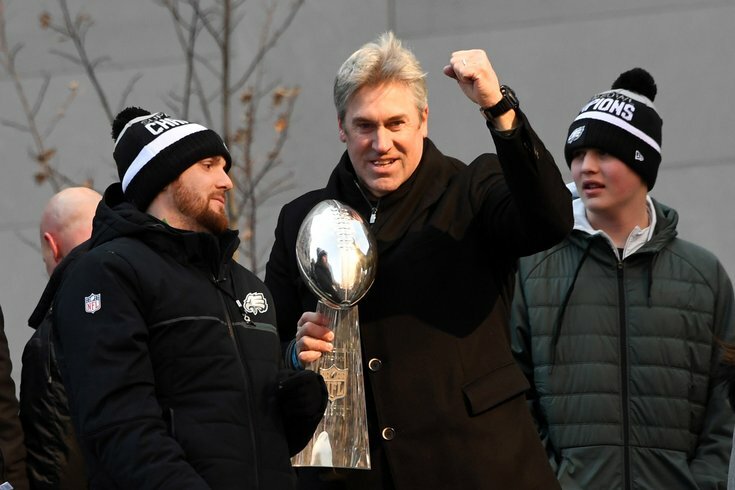 Luckily for Eagles fans, Pederson listened to none of it, as he eschewed conventional NFL wisdom, becoming one of the most aggressive in-game decision makers in NFL history. On the season, as we laid out in depth back in February, Pederson's fourth down decisions in 2017 yielded around 74 additional points that the Eagles otherwise would not have scored had they played it safe. They missed out on a grand total of three points on aggressive fourth down calls that failed. It will be interesting to see which teams begin to copy Pederson's aggressive approach, and which dumbass teams continue to punt on 4th and 2 from the opponent's 40. We'll see, but there's a decent chance that Pederson will go from a guy widely regarded as the worst coaching hire in 2016 to a revolutionary figure in the NFL in just two years.